A man from Big Sandy, Tennessee was one of at least 58 people killed when a gunman opened fire at a crowded Las Vegas concert on Sunday, Oct. 1. Sonny Melton was killed when the gunman identified as Stephen Paddock shot into the crowd late Sunday, killing at least 58 people and wounding over 515 more. Sonny died a hero—he was protecting his wife when the bullets hit him and others among the outdoor crowd of 22,000 people. His wife, Heather Gulish Melton, told Fox affiliate WZTV she was in complete disbelief. According to the station, Sonny is the first victim identified in the Las Vegas shooting. “At this point, I’m in complete disbelief and despair. I don’t know what to say,” Heather said in a statement to WZTV. “Sonny was the most kind-hearted, loving man I have ever met. He saved my life and lost his,” she added. Paddock, 64, is the suspect in what is the worst mass shooting in U.S. history, according to ABC News, where he shot people from the 32nd floor of a hotel tower. According to Sonny’s Facebook profile, he is a registered nurse who worked at the Jackson-Madison County General Hospital in Jackson, Tennessee. Just days earlier on Friday, Sept. 29, Sonny posted on Facebook that he was attending the Route 91 Harvest Festival in Las Vegas with his wife. As the news spread, many people lefts words of condolences and support on Sonny’s Facebook page Monday. “God Bless you Sonny Melton, you will always be a Hero. Prayers for his wonderful family.” one person wrote. “My love and heartfelt sympathy to Sonny’s beloved family. Very sorry to hear of his tragic loss. May God Bless you and comfort you. Thinking of you all!” wrote another. The death toll, which police emphasized was preliminary, eclipsed last year’s massacre of 49 people at an Orlando nightclub by a gunman who pledged allegiance to the ISIS terrorist group. 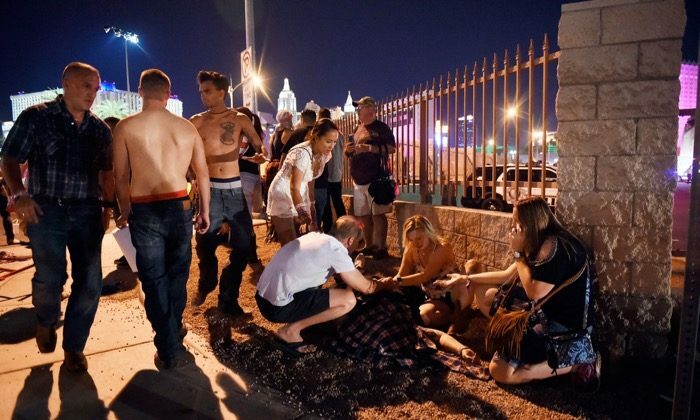 Shocked concertgoers, some with blood on their clothing, wandered the streets afterward. Police said they had no information about Paddock’s motive, that he had no criminal record, and was not believed to be connected to any terrorist group. Paddock killed himself before police entered the hotel room he was firing from, Clark County Sheriff Joseph Lombardo told reporters. Two senior U.S. government officials told Reuters that Paddock’s name was not on any database of suspected terrorists and that there was no evidence linking him to any international terrorist group. One of the two U.S. officials discounted a claim of responsibility that was made by ISIS. There was reason to believe that Paddock had a history of psychological problems, the official said.